Arriving at Bourg Saint Maurice. Return confirmation 48h in advance at the Peisey-Vallandry tourism office. Bring your reservation ticket. Transfer with connexion in Bourg Saint Maurice. Departure time from the resorts to be confirm at the reservation. Or by train From Lyon St Exupéry to Landry station. 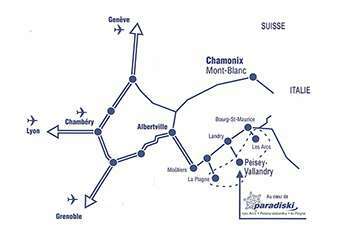 Transfer with Ben Bus* from Grenoble Airport to Tarentaise valley. Arriving at Aime or Bourg Saint maurice. Then by train to Landry Railway station. *Ben's Bus operates week-end shared transfers from Grenoble, Lyon and Geneva Airport to Aime. From Aime, you can catch either the local bus or a taxi to your resort. For more information about this, including their prices, bus times and how they operate, please visit the correct page of their website from the list below. To find information about how to get from Aime to your resort, click the section "ONWARD TRANSPORT FROM AIME" once you are on the Ben's Bus website.